This CellML model runs in both OpenCell and COR and the units are consistent. However the model is unlikely to reproduce the published results as some parameters were not defined in the paper. Values for "s" and "d" were take from a previous model by the same author (Perelson et al. 1993). For this particular model eta = 0.80, epsion = 0.99, c = 5, and delta = 0.5. ABSTRACT: To better understand the dynamics of hepatitis C virus and the antiviral effect of interferon-alpha-2b (IFN), viral decline in 23 patients during therapy was analyzed with a mathematical model. The analysis indicates that the major initial effect of IFN is to block virion production or release, with blocking efficacies of 81, 95, and 96% for daily doses of 5, 10, and 15 million international units, respectively. The estimated virion half-life (t1/2) was, on average, 2.7 hours, with pretreatment production and clearance of 10(12) virions per day. The estimated infected cell death rate exhibited large interpatient variation (corresponding t1/2 = 1.7 to 70 days), was inversely correlated with baseline viral load, and was positively correlated with alanine aminotransferase levels. Fast death rates were predictive of virus being undetectable by polymerase chain reaction at 3 months. These findings show that infection with hepatitis C virus is highly dynamic and that early monitoring of viral load can help guide therapy. 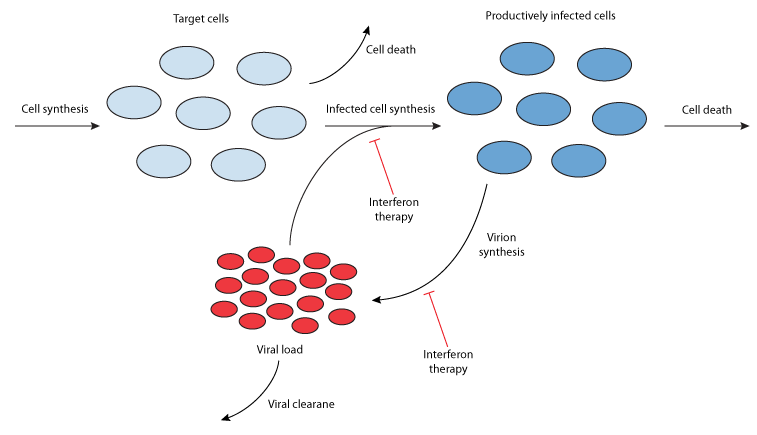 Schematic diagram of the viral dynamics of Hepatitis C in vivo. Derived from workspace Neumann, Lam, Dahari, Gretch, Wiley, Layden, Perelson, 1998 at changeset 630f3a54b30b.